Frank and I are not the typical guests found inside the Burj Al Arab luxury hotel. 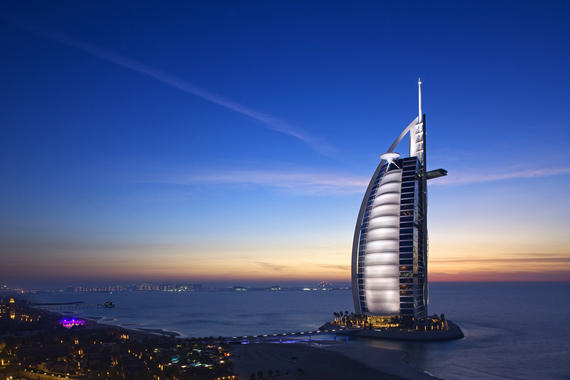 Branded as the only hotel in the world to have a 7 star rating, the Burj Al Arab caters on royalty, celebrities, and the world's most elite clientele. However, for one morning, Frank and I, two American undergraduates studying abroad in Dubai got a glimpse inside the most luxurious hotel in the world. Upon arriving in Dubai, the Burj Al Arab is an instantly recognizable part of the skyline. Shaped like an Arabian dhow boat sail, the hotel is nestled on it's own private, man-made island in the Persian gulf. From the moment I saw the hotel illuminated in colorful lights on the late night taxi ride from the airport to my dorm, I put going inside at the top of my "Dubai Bucket List". Frank Musuruca, a fellow classmate, shared my desire to peak into the exclusive hotel and we began to plan our visit. Unfortunately, Frank and I quickly found out that checking out the lobby, unlike most American hotels, is not as simple as walking inside. To get on to the private island, one must either be staying at the hotel or have a reservation at one of the resort's restaurants. With the cheapest room costing over $1,000 a night and most meals priced at a minimum of $250 a person, the Burj Al Arab was out of my "I am a college student and eat ramen noodles for most meals" budget. Determined to get inside, we schemed several possibilities that did not involve us spending the entirety of what we had budgeted for the summer abroad. As a last ditch effort, we emailed the PR office of the hotel asking for a tour in exchange for a blog post. Not expecting a response, we were beyond ecstatic when we received an email the following day from the Marketing Communications Executive of the Burj Al Arab granting our tour request. On the morning of the tour, we woke up early (a large feat for a college student) and got ready in our mold infested dorm rooms. Dressed in the nicest clothes we brought on the trip, we walked in the 105 degree heat to the bus stop and paid our $1 fare. We excitedly discussed our expectations for the tour as we took the Dubai Public Bus to the fanciest hotel in the world. From the bus stop, we walked in sweltering heat to the private island's entrance. As we approached, a guard stepped out of his post and asked us if we had a reservation for the hotel - he was likely confused as to why two kids were walking up (not even in a taxi) to the opulent hotel. We gave our names. I think all three of us were surprised when our names were on the list and we were granted access onto the property. Frank and I attempted to remain calm and hide our amusement as we walked on the pathway approaching the hotel. However, the thrill of the situation won out. Staying true to our millennial status, we couldn't pass up the opportunity to Snapchat the experience and take selfies in front of the hotel and the Rolls-Royce fleet parked out front. Entering the grand lobby, we immediately understood the hype. As we waited for our tour, our eyes bounced from the fountain garnered in Ramadan decorations to the aquarium wall to the colorful floors in the atrium above us. We tried our best to maintain our professionalism. Nina, the marketing executive, did not treat us differently when she discovered that she was tasked with giving two American college students a tour. Most people in Dubai became disinterested in catering to us when they determined we did not have a large pocketbook. Many portions of the hotel were under renovation but Nina took us on a complete tour. She took us to the top floor where we were able to look down at the 202 suites. Each floor had it's own personal butler whose sole job was to acquiesce the every whim of guests. Guests also receive a 24 karat iPad upon check in and pillow menu with 17 different options. The highlight of the tour was when Frank and I were casually informed that we would be touring the Royal Suite - the most luxurious and most expensive suite in the hotel. In the United States, we know the Presidential Suite to be the top room in a hotel. 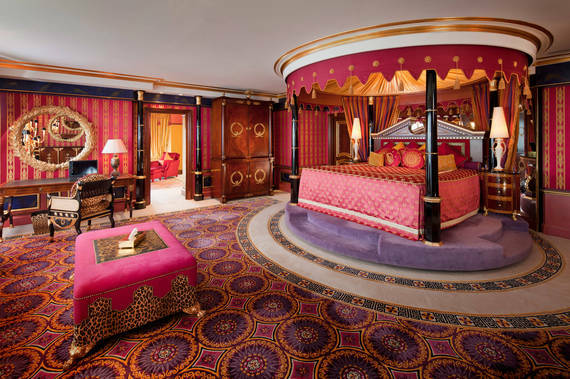 In the Burj Al Arab, the Royal Suite is a step above the Presidential room. We pretended to remain calm as we approached the Royal Suite's imposing double doors on the top floor. Our jaws dropped as we entered the foyer. Costing over $25,000 a night, the suite is over 8,000 square feet featuring two floors, a private movie theater, and dining room. While in the suite, it impossible to look in any direction without seeing gold. From the Hermès products in the bathroom to the private elevator, the suite oozed luxury. When we saw the four poster canopy bed rotating, we didn't even try to hide the fact that we were Snapchatting. Frank and I were also treated to a visit to the Skyview Bar. Located on the 27th floor, we were clearly able to see both the Palm and the World Islands through the floor to ceiling panoramic windows. After completing the tour, we were graciously walked to the lobby. After leaving the hotel, we were quickly reminded that we do not lead the same life of luxury as the rest of the hotel's guests. As we struggled to decipher the bus routes so we could get back to our dorm rooms, we both agreed that the Burj Al Arab lives up to it's image as the most luxurious hotel in the world.